Vinnie Pestano praises player (alliterations are fun)! There are usually some pretty good stories that come out of Fantasy Camp week. Sometimes they are stories shared by the former players about their old teammates and the crazy stuff they would do. Sometimes they are stories told by veteran campers about past camps they’ve attended both here in Goodyear and even those camps that took place in Winter Haven. I’ve had the opportunity to witness these stories as they are happening–before they become actual stories–and I’ve probably helped spread them around, turning them more into fish tales instead of factual events. This year hasn’t been any different. In fact, one particular story stands out to me this week. It all began when one of the campers, Dennis Barriball, tried to catch a pop fly during a game on the second day of the tournament. In what appears to be a random freak accident, as Dennis was catching the ball his achilles decided it didn’t want to stay intact anymore. Dennis fell like a shanty in a snowstorm and, after being checked out by our trainers, was diagnosed with a blown out achilles. For most people, this would be the end of Fantasy Camp. The inability to walk makes it tough to play any baseball games. Dennis thought differently and decided the next day that he could at least bat for his team (in Fantasy Camp they allow pinch runners to start at homeplate and run to first as soon as the ball is hit). Rumors of his stupidity heroics made it to the major league side of the complex where Cleveland Indians pitcher Vinnie Pestano tweeted about it. Here at the Indians, we like to Connect our fans to the players so we asked Vinnie if he cared to meet Dennis. Without hesitation, Vinnie said he would love to and the rest is history. Many other great stories happened this week, but this was the one that sticks out the most. An average guy comes to Arizona to live out his fantasy of playing baseball just like the pros. He gets to be managed and taught by former players that he grew up idolizing. He gets to use the same facilities that the current Tribe players use and if this isn’t enough, he not only ends up catching the attention of pro ball players, but he gets to meet them too! If that isn’t Creating memories and Connecting generations, I don’t know what is! Thank you to Vinnie for being a stand up guy and to Dennis Barriball for, well, just being a guy who can stand up on a blown achillies! 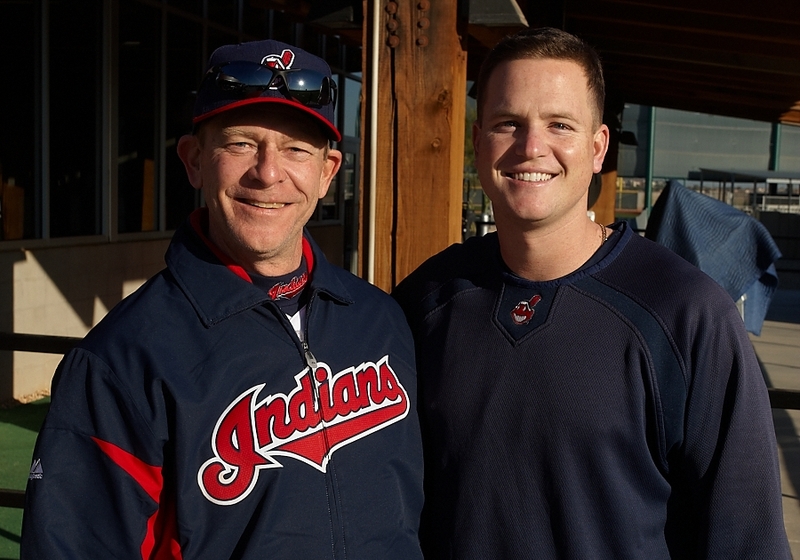 Today, January 16, I am celebrating my 5th year anniversary at the Cleveland Indians. Please…hold your applause. Normally I would have prepared a speech and had a little party after work, ask people to bring gifts and cash, and reflect back on the 5 years that have been. Unfortunately, I am not home in Cleveland around my favorite co-workers (you know who you are and who you aren’t). I am instead burdened with the task of going out to dinner and hanging out with Indians alums: Dave Burba, Mike Jackson, Brian Anderson, Chad Ogea, Len Barker and a few others. I’m stuck down in Arizona at the Cleveland Indians Spring Training Complex for the week instead of being able to enjoy the cold, snowy weather in Cleveland, Ohio. I have no choice but to get paid to entertain these former pro baseball players while they manage/entertain/teach campers all week for our Indians Fantasy Camp. Five years of working at the Indians and I’m lucky unlucky enough to have to do this. Boy what I wouldn’t give to have a cool job. I hope you picked up on the sarcasm because I was laying it on pretty thick. Are you kidding me? I love this! 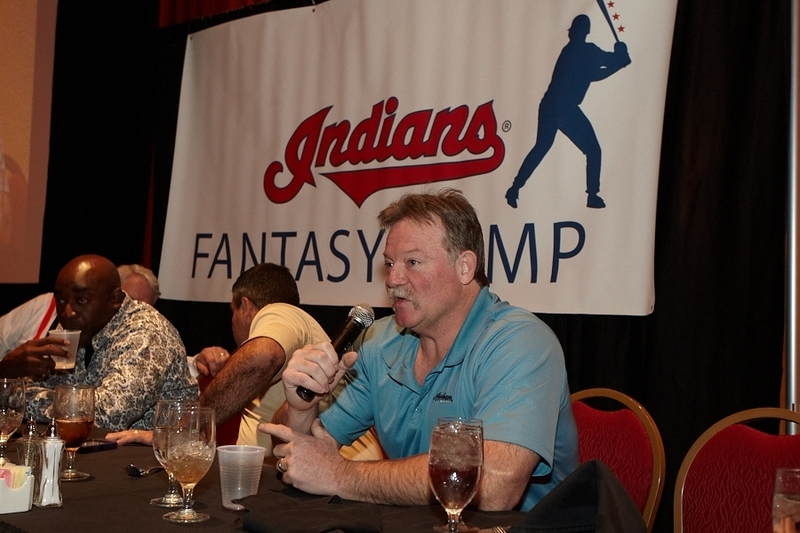 Cleveland Indians Fantasy Camp is going on this week down in Goodyear, Arizona and so far it is a blast! The camp is open to anyone (male or female) ages 30 years old and up. You can be 85 and still participate if you are able to! People come from all over the country to take part in this camp and basically live the life of a major league ball player (minus the ginormous salary, of course). The campers get to stay at a 5-star hotel, have breakfast and lunch at the Indians complex, be drafted onto teams which are managed by former Indians players, play in a tournament style set of games and have a championship game in the main ballpark. The most important part about this camp is that all of the money raised here goes to Cleveland Indians Charities (CIC). Every night there is always a Kangaroo Kourt, where our judge and former Indians pitcher, Gary Bell, will fine the campers for doing things incorrectly or just downright stupid. Any money raised from the fines also goes to Cleveland Indians Charities. You should actually want to get fined because you know your money is going to a good cause. So that is where I’m at this week celebrating my 5 year anniversary at this ball club. I may post one or two more updates on the week for my die-hard fans out there–which I’m calling the Sherman Screwballs. I will at least keep you posted on who wins the championship and how much money we end up raising. As always, thanks to Dan Mendlik for the picture (and future pictures from this week). Welcome back to my blog! I say that as if you people left me and are just now coming back, when in reality I know that you didn’t really leave me. You just realized that there weren’t any new blog posts since the beginning of December 2011 and there was no reason to come back until now. One could blame me for the lack of blog posts. I blame the Indians for giving me so many vacation days in a one year period and having such a busy schedule from January through November that I can’t actually use them until the last month of the year so they just pile up and I take them all at once! That was quite a run-on sentence there, eh? Anyway, I’m back now and that is all that matters, really. I’m here to share with you the Indians first Indians in the Community of 2012. Once again we kick started our year of volunteering at the St. Augustine Hunger Center in Cleveland. 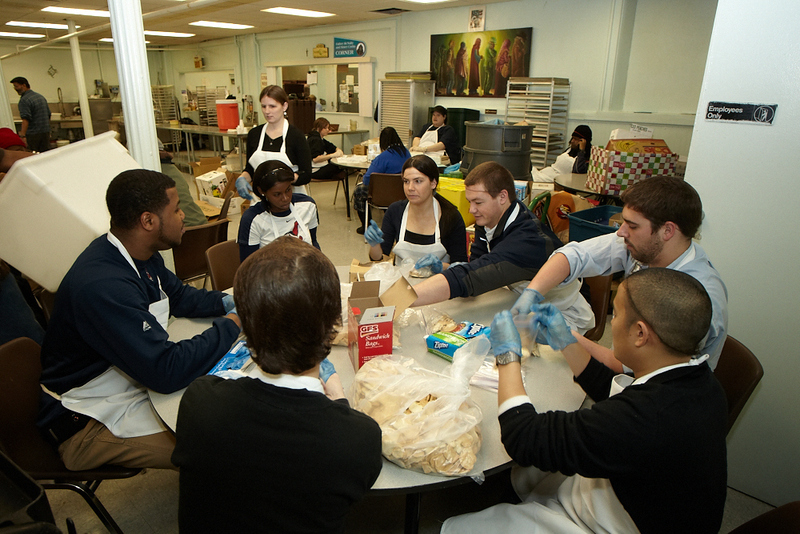 We had about 14 members of the Indians Front Office help prepare and serve lunch on January 11. We did anything from peeling potatoes, to cutting up peppers and onions, to re-stocking their food pantry. We then worked on the buffet line and served the customers their lunch. The meal was a pretty square meal including Italian sausage in cooked vegetables, mashed potatoes, salad, green beans, beef soup, bread, and a nice little piece of cake for dessert. It was great to share some laughs with the customers of the Hunger Center and some of us even shared some tears–not with the people but more so with the onions as we cut them up (pause for laughter)! The Hunger Center opened it’s doors over 30 years ago and is part of the St. Augustine Church. For those that are wondering, the Hunger Center does not only provide meals, but also addresses other needs of the poor and the homeless such as: food, clothing, emergency funding for rent and utilities, furniture, appliances as well as advocating for those poor seeking medical help. They are always accepting of donations and, from our experience there, are in definite need of potato peelers, napkins, and plastic silverware to name a few things! Thank you to all employees who volunteered as well as Dan Mendlik for taking the photos.